My work at Jefferson University has taken me nearly all over the world, including many cities in Western Europe, Australia, and Japan, but never before to the amazing and alluring nation of India. I was, therefore, looking forward to teaching and working with colleagues at KLE University in Belgaum, India, an approximately 3.5-hour hair-raising car ride east of Goa. To prepare for my visit, I skimmed the new book, Our Time Has Come, by Alyssa Ayres.1 I also read up on foreign affairs to understand India’s new, perhaps controversial prime minister, Narendra Modi.2 I also looked at the Modern Healthcare equivalent in India called Healthcare Radius, including a recent article on hospital-acquired infections in India.3 I did my best to prepare, but, frankly, nothing could prepare me for what some have called “the 3 Cs of India”—colorful, complicated, and chaotic. After landing in the storied city of Delhi, as the door of the aircraft opened, I was instantly struck with a smoky, slightly spicy scent, akin to an open fire pit of incense and pollution. The stop in Delhi was to acclimate before our travels to Belgaum. I was fortunate to be with my physician wife for the trip, and we took a day trip from Delhi to the fabled city of Agra, home to India’s most iconic structure, the famous Taj Mahal. The Taj Mahal was a spiritual experience for me: it is hard to describe its beauty and the way it seemingly floats in the sky with a purposefully designed, unobstructed view. The relationship between Jefferson University and KLE University is largely attributed to some very senior Jefferson University faculty with a long history of global research in maternal-fetal medicine and other longstanding projects. My visit was an opportunity to introduce them to our College of Population Health and, specifically, to look for 2 or 3 areas for future collaboration. In addition, I was asked to make 2 formal presentations—one to the senior leadership and faculty, and the other to the students. I’m happy to provide the content of my presentations on request. The real work of the trip began when I visited KLE University, an incredible, sprawling, conglomerate of an institution that includes a 2000-bed hospital, a well-known medical school, a pharmacy school, a department of public health, a dental school, and many other clinics spread across the Indian state of Karnataka. When I arrived at the hospital on a warm January day, we were greeted with hot tea and cookies by the dean of the medical school, who was regally dressed in a formal sari. She introduced me to members of her team, and it was evident that she was going to stick to the planned agenda. When the introductions were over, we went into the hallways of the two 1000-bed hospitals: one for nonpaying patients, and one for patients who were lucky enough to have some form of private insurance. For our readers, India has what could be described as a national healthcare system for the poor, whereby they do not have to pay at all, and a patchwork quilt of for-profit and not-for-profit hospitals and health centers, where paying patients have nicer facilities. KLE University is a not-for-profit medical center, at least in the way that we would describe one in the United States. As we alighted through the hallways, I knew I was in a colorful, complex, and chaotic land when the uniformed hospital security guards, although unarmed, snapped to a British-style salute as the dean passed. They also held the elevators and ran ahead of us, along with a photographer, to keep the surging crowds in the hallways out of our way as we toured the various clinics, operating rooms, and clinical departments of the charitable and paying parts of the sprawling structure. I saw things that would make most American-trained physicians raise an eyebrow, including open windows everywhere; 4 or 5 beds to a room, with family members hovering about each bed; and long lines of patients everywhere. But yet, they all seemed happy, well cared for, and, in a way, grateful for the attention that they were receiving from the exceedingly well-trained staff. I was determined not to be the “ugly American” but rather to keep an open mind and try to place myself in such a setting. This sprawling institution has 265 critical care beds—that’s an entire community hospital in the United States! We went into a modern neonatal intensive care unit, and once again, the female physician leader of the unit was so proud to describe the babies under her care, their birth weights, and the plan for the day. I am a general internist, but I could grasp the weight of responsibility on her shoulders. Thinking about my 30-year career in academic medicine, I am confident that I have visited nearly 1000 hospitals in our great country, but nothing came close to the experience I had in the hallways at KLE University. Because one of my hosts was the director of the Department of Public Health, she insisted the next day that we visit 2 off-site clinics, one in a rural part of Belgaum and another in the heart of the city. As the director described it, both clinics represent a private–public partnership between the state government of India and KLE University, whereby the university provides the staff and the Indian government provides the physical resources. We drove for approximately 40 minutes into an agricultural area to visit the rural site. This particular rural clinic had a catchment area of 14 square kilometers and a population of nearly 74,500 souls in 30 different villages. 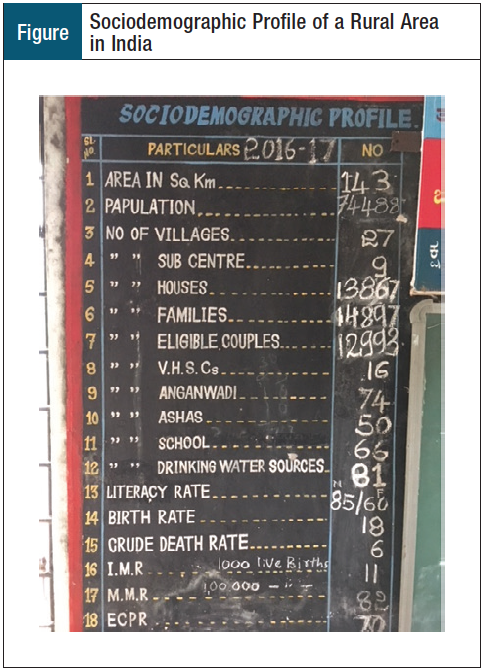 It struck me that this represented their “attributable lives” and was population health literally at the ground level, which was represented on a chart written in chalk on a blackboard there. The 74,000 souls were allocated among 74 accredited social health activists (ASHAs), what we might call a community health worker, and each ASHA is responsible for 1000 patients. I learned that these ASHAs do not have a Master’s degree in public health, and most are trained in a special 1- or 2-month program and live in their village. The ASHA is supposed to know who may be pregnant, who suffers from malnutrition, who needs a referral for care, and so on. I was particularly struck by line 13 in the sociodemographic profile (Figure) of the attributable lives in that the literacy rate for men was 85%, whereas for women it was a paltry 60%. My host explained that women do most of the backbreaking agricultural work and are sent into the fields instead of going to school. Later that same day, we drove back to town and visited a city clinic. There, the prevalent diagnoses looked more like my general internal medicine practice, with hypertension, obesity, and diabetes topping the list. India has come onto the world stage for sure, and now suffers from some of the first world’s most challenging health-related problems. After a morning spent visiting the clinics, we had lunch in the hospital cafeteria with select members of the faculty. My wife and I were careful to observe necessary precautions in India, and our hosts were understanding that we never drank tap water, never had an ice cube, never touched a vegetable that was not cooked, and never went anywhere without our personal supply of hand sanitizer and alcohol wipes. Without going into a detailed description of hygiene issues in a nation of 1.2 billion people, let’s just say that hygiene is a challenge. After the faculty luncheon, I had the true privilege of visiting several classes in the Department of Public Health. Trailing behind the head of the department, I gasped as the teachers and students nearly leapt to attention when we entered each classroom. After being seated, each student then rose to briefly explain his or her background, including their country of origin and major area of study. The class represented a kaleidoscope of colors and nationalities. I was particularly struck by the women from Somalia, Sri Lanka, Nepal, and even Yemen. I wondered what their personal journey had been like, especially the journey from areas of persecution to the study of public health in India. I was humbled by my life of comparative privilege, and when asked to briefly address the class, it took nearly all my self-control to fight back my swirling emotions. Although India may not have every resource of first-world medicine, no one in India goes bankrupt because of an inability to pay for healthcare. This struck me as an astute observation by one of KLE University’s faculty, and one that leaves me increasingly vexed about the future of our own healthcare industry. I’m sure that I will be processing other aspects of my visit for months. I already find myself wistful when I review the photos from our trip, because I enjoyed meeting many of our clinical colleagues. The India I saw in my brief 10-day visit was indeed colorful, complex, and chaotic. The next time I practice my weekly yoga and we say “namaste” to our teacher at the end of the session, I’ll have a new appreciation for the deeper meaning of our practice. 1. Ayres A. Our Time Has Come: How India Is Making Its Place in the World. New York, NY: Oxford University Press; 2018. 2. Chandra K. Who is Narendra Modi? The two sides of India’s prime minister. Foreign Affairs. March 30, 2017. www.foreignaffairs.com/articles/india/2017-03-30/who-narendra-modi. Accessed January 24, 2018. 3. Dutta R. Preventing HAI. Healthcare Radius. 2017;6:22-28. 4. Richman BD, Schulman KA. What U.S. hospitals can still learn from India’s private heart hospitals. NEJM Catalyst. May 25, 2017. https://catalyst.nejm.org/us-hospitals-learn-india-heart-hospitals/. Accessed January 24, 2018.